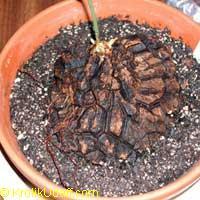 Elephant Foot is a collectors item, but remarkably easy to grow. It will be with you for years with no effort. It is a wonderful conversation piece! It is a curious plant with tuber above ground level covered with layers of corky bark, resembling a caudex. It is a slow growing, very unusual succulent. 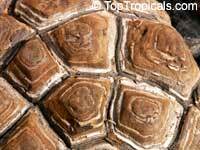 Its main feature is a large, corky caudex that grows up to 6’ in nature, resembling an elephant's foot (hence the popular name). The caudex looks as if it is segmented into geometric patterns (smaller plants look like tortoises) and looks dead but is actually a living tuber. A plant with 18" caudex can be almost 100 years old. 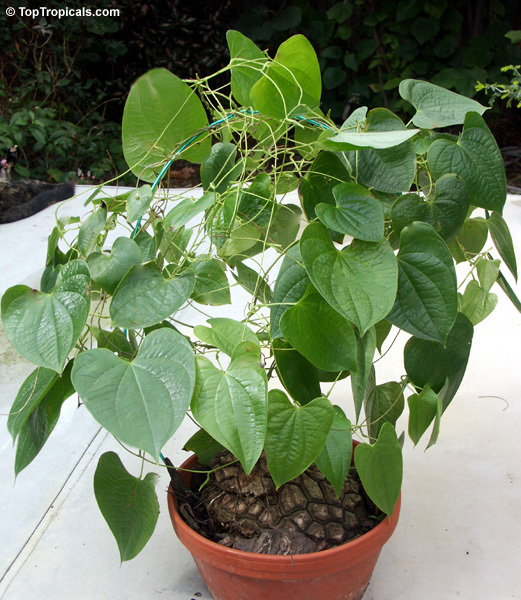 The plant grows into a vine with attractive heart-shaped leaves and small yellow flowers. Culture is relatively easy. A greenhouse is great, but a windowsill with moderate to full sun works fine, as long as the plant is kept at 65F min. The vines may die back and regrow several times a year, depending on the particular plant and your region. Several plants in the same pot can go dormant in different times. Tuber contains saponins, originally cooked and eaten as a famine food by the Hottentots. The plant is dioecious (male and female flowers are produced on different plants). The 0.2 inches wide (4 mm), greenish-yellow flowers are insignificant. Seeds are the only way to reproduce. 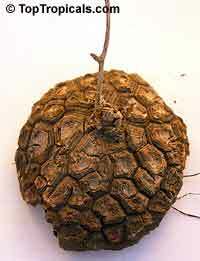 The seedlings caudex forms below ground and will grow much faster if left underground for a couple of years. 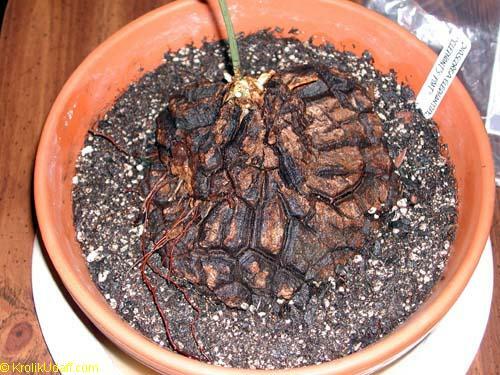 D. elephantipes doesn't send down deep roots, so plant in a shallow pot (I use clay bulb pots) about 1" larger than the diameter than the caudex. Potting soil should be very porous/loose so that there is easy drainage. 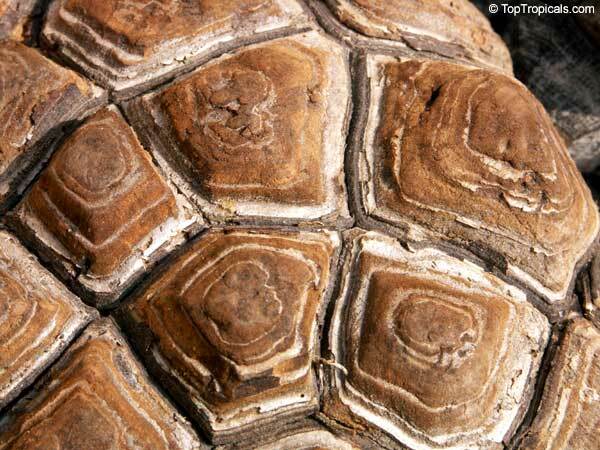 Think about the area in which they grow natively. Remember that these plants are tropical DESERT plants. The soil should be very loose and drain very freely. 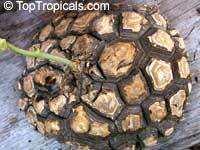 Allow the soil to come up and slightly over the edge of the caudex 1/4"- 1/2" so that the edges are covered. Water well around the edges, being sure not to get water into the point from which the vine will grow (usually there some pieces of old vine in the growing area). Keep in a warm area and wait for the first shoots of the vine to appear. Water regularly from that point on. Use dilute (25 percent of normal) fertilizer with each watering. The plant should not be kept damp as with other tropical plants. Allow it to *almost* dry before watering again. The plant has natural dormancy period. That being said, however, my experience is that the plant will go dormant when *IT* wants to. If the vine begins to yellow and die back, limit the water and stop the fertilizer. If the vine dries up cease all water and move to a cool place for a couple of weeks. Return to a sunny area and wait for the vine to sprout again. NOTE: Many books will say that they are winter growers, because they are native to the southern hemisphere. In my experience they are opportunistic growers. I have had them grow in all seasons. I have had plants that went dormant for a couple of weeks and others who were dormant for months. Let the plant be your guide. You cannot force them to grow, and over watering will simply cause them to rot.